Welcome to the Fieldhouse Bar & Grill! The Fieldhouse Bar and Grill is the brainchild of a member of an old Louisiana family. Restaurant entrepreneur Joey Trappey grew up in Cajun Country as a part of the legendary Trappey’s foods dynasty. * As a result, Joey was no stranger to good eating or good business. After graduating from high school, Joey made his way to north Louisiana to attend the University of Louisiana at Monroe. While at ULM, Joey was very active in the sports program playing both football and basketball. Monroe began to feel like home. Once he graduated from ULM with his MBA, Joey saw an overwhelming need for a family-friendly, casual eatery near campus where locals could enjoy affordable, quality food and drinks. “Before the Fieldhouse, there was really nowhere like it to go after the game to carry on the celebration. I saw a need for a place that had great food and great service where people could be comfortable. So at age 26, I started a restaurant,” he explains. After investigating possible franchises, Joey didn’t feel like any were a fit with his vision, so he dipped back into his food background, and The Fieldhouse was born. 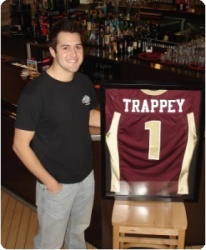 Due to the location’s proximity to campus and Trappey’s background on the football field and basketball court, the sports theme was an obvious choice. Giant screens adorn the walls of the eatery and are tuned to various sporting events. The laid-back establishment offers two dining rooms and a prominent bar area with a suitable selection of draft and bottled beers, wine and mixed drinks. However, it is the all-star menu that keeps patrons coming back. Part sports bar, part family restaurant, The Fieldhouse is all southern hospitality, fantastic food, and local flavor. *Trappey’s Fine Foods, Inc., got its beginning in 1898 in New Iberia, Louisiana, with the creation of their original hot sauce. Since then the family business has grown into a well-respected national line of traditional southern foods. 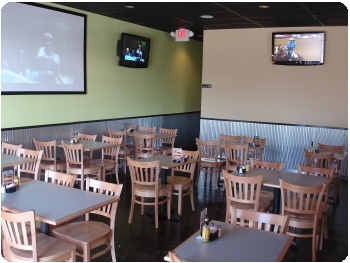 Conveniently located 2.5 miles from Interstate 20 on 165 in North Monroe, Fieldhouse Bar & Grill is a locally owned sports bar/restaurant that offers a great atmosphere and unique experience for any sports fan. We invite you to come in and try one of our mouth-watering Fieldhouse Burgers or join us for drinks in our full service bar.